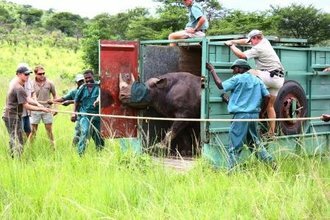 On the 30th of December 2010, an injured Black Rhino that had been destined for a relocation project, was released back into its original home in Hluhluwe-iMfolozi Park. The rhino had spent a few months recovering in the HiP holding boma. Once loaded from the boma into a game capture transportation crate, the rhino was driven a further 40 minutes into the park, to the area where the rhino had originally been captured. Once at the release site, the veterinarian administered an immobilising drug while the rhino was still in the crate. Just before the drug took full effect, the doors were opened and the rhino was allowed to slowly exit the crate. Volunteers and EKZNW staff “braked” the rhino with ropes in order to prevent it from stumbling too far and injuring itself as it fell. Once the truck, crate and personnel had been moved out from the vicinity, the veterinarian administered the antidote, leaving the rhino in peace and quiet as it “woke up” in it’s former ‘home range’. The rhino was fitted with a radio transmitter to help monitor its recovery and progress, and to gain more insight into the Black Rhino population within this protected area.